human sacrifices – All Things AAFS! 01/01/2014 by All Things AAFS! Aztec ‘Human Sacrifice’ Remains Found Under Mexico City Subway. Archaeologists who surveyed a Mexico City subway in order for an extension to be performed have announced they made a startling discovery – unveiling what is thought to be remains of Aztec sacrifices. 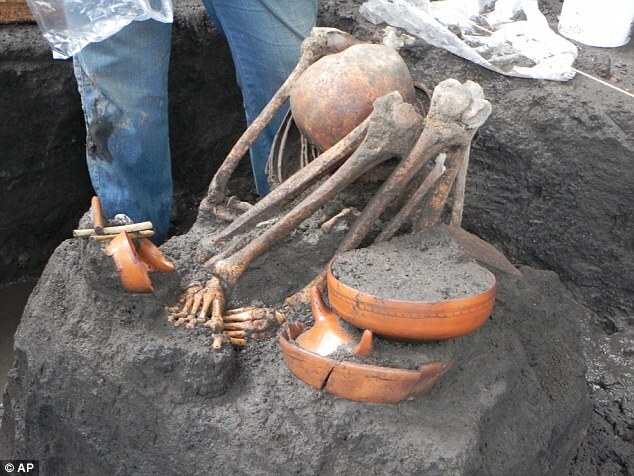 One of the human remains found at the excavation site which was thought to be a human sacrifice – with offerings beside them. The team of archaeologists, led by Maria de Jesus Sanchez from the Mexico’s National Institute of Anthropology and History (NIAH), have unearthed a dog’s skull with holes in it. As well as the dog skull, a female’s skull and two male skulls with the same indents were also found in close proximity. It is thought that these skulls are the remains are from Aztec offerings, due to the bizarre nature of the holes that perforate the skulls. It is thought that these holes would have allowed the skulls to be displayed on a rack, known as a tzompantli, for the public to see. Tzompantli were commonly used within the ancient Aztec world for displaying the severed heads of captured warriors, who were sacrificed as an offering to the Gods. The skulls have been dated back to between 1350 and 1521, and the discovery of the dog’s skull with such punctures is the first of its kind according to the NIAH, making it a very important find. It is thought that the dog was sacrificed because in some pre-Hispanic beliefs, a dog can accompany its owner in the afterlife. 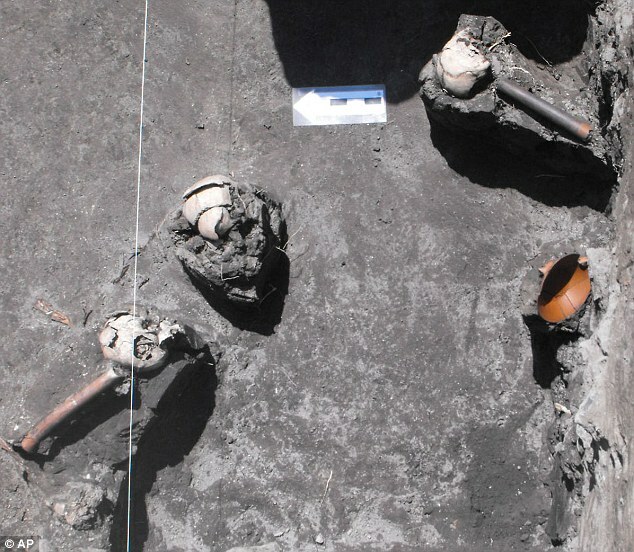 The human skull, center, and dog skull, top right, that was discovered at the site. But these skulls weren’t all that was found during this excavation – one hundred burials were also uncovered with the majority of the skeletons being juvenile. NIAH. 2013. 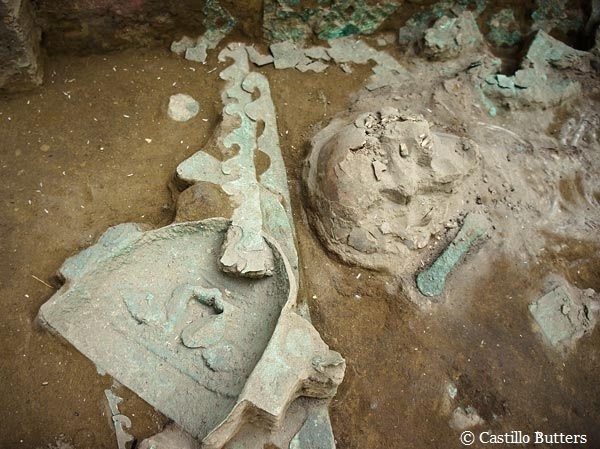 SKULLS OF A ‘TZOMPANTLI’ BETWEEN FINDINGS ON METRO LINE 12. 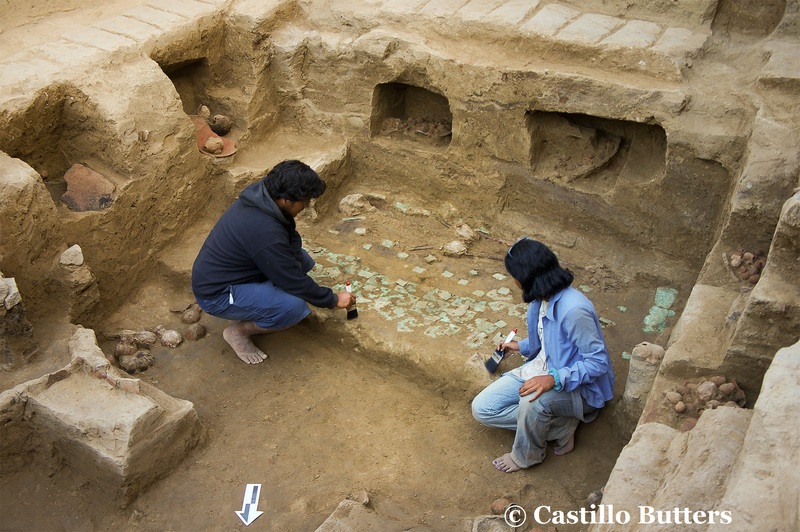 Archaeology – Bulletins. Available here.